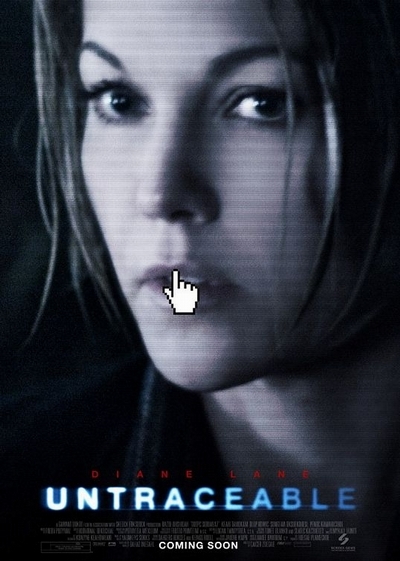 Story: "Untraceable" is about a secret service agent, Jennifer Marsh, played by Best Actress Oscar nominee Diane Lane who gets caught in a very personal and deadly cat-and-mouse game with a serial killer who knows that people (being what they are - both curious and drawn to the dark side of things) will log onto an "untraceable" website where he conducts violent and painful murders LIVE on the net. The more people who log on and enter the website, the quicker and more violently the victim dies. Suspenseful, intense and action oriented, "Utraceable" also has a relevant and accurate message about today's society. Why are we drawn to "evil" in our media etc. Just look at the news or read a newspaper... it's all bad news and often murder, yet we are drawn to it and read about it. This film explores that but not in a preachy way but in a way that is both intense, entertaining and thought-provoking.